Bird Baths - Which Kind Should I Get? Bird baths are a great way to attract birds to your yard and can be a decorative addition to your landscape. The number and diversity of birds visiting will increase and they will spend more time in your yard since they don't have to go searching for water elsewhere. Birds that don't visit your feeders, may come to your water basin. 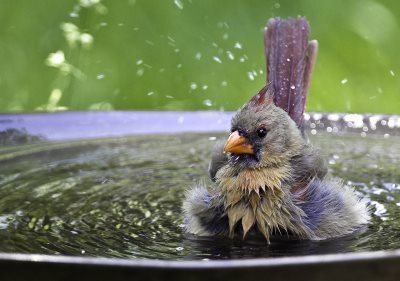 Robins, waxwings, wrens, swallows, bluebirds, other insect or fruit-eating species won't come to your seed feeders, but will appreciate a nice cool drink and bath. Size: Bigger, wider, multiple tiers will attract more birds but will take more time and effort to keep clean. Depth: No deeper than 2-4 inches (8-10cm), preferably shallower at edges, with a gradual slope. Most birds don't like bathing in water above breast height. Bottom Surface: Should be textured or rough. Slick, slippery bottoms make birds uncomfortable just like we do walking on a wet pool bottom with bare feet. 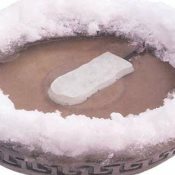 If you purchase a bath or fountain with a smooth bottom, you can rough it up with coarse sandpaper, fill it with natural pebbles/stones/rocks or other non-skid applications. Placement: Away from predators. In most neighborhoods, the greatest threat is cats, dogs and raccoons. Keeping it elevated will also keep these animals and others from drinking the water and making it dirty before the birds even get to it. If the bird bath isn't already on a pedestal, raise it up as high off the ground as you can. Also keep it away from thick cover where predators can hide. Next to or under a tree is ideal. The tree can provide shade to keep the water cooler and birds will have a place to perch when coming to or leaving the bath. Sound: Moving. trickling water, like a babbling brook, stream or river attracts birds more so than silent, stagnant water. You can get a fountain with built-in pumps, even solar-powered, or create your own drip/trickle into the fountain with a dripper that attaches to a hose or hang a container above the bath and pierce tiny holes that will slowly drip into the bath throughout the day. You can line the container with cloth or something similar to slow down the dripping. Hummingbirds: Although not common, I've seen hummingbirds dip in and out of a small brook to bathe. They will visit your bath, but will especially appreciate a mister that they can fly through. Being so small, they rather fly through a mist then get into a pool of water which makes them more vulnerable to predators. Refill and Cleaning: Make sure you place your bath close enough so that it can be easily refilled and cleaned out with a hose. On hot days, refill at least once a day. Use a wire brush to scrub out any accumulated dirt or algae. To keep your water clean in bird baths with fountain pumps and clear and free of algae build-up there is a product called EasyCare FounTec Algaecide and Clarifier. 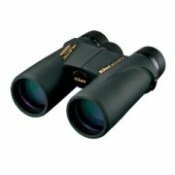 It's safe for birds, plants and animals (but not fish) and easy to use. One dose every 2 weeks during the summer, then once every four weeks during the rest of the year. If nothing else, make sure you at least exchange stagnant water out with fresh and remove dirt, debris and algae. Otherwise, the birds are better off without your bird bath if it is not kept clean. 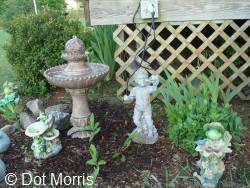 Q: Is It Safe to Spray Paint My Bird Bath? A: Yes, you can spray paint your birdbath. But do not use any spray paints that are oil or petroleum based. Make sure the bird bath is completely dry before painting. You should apply at least 2 coats, allowing each application to dry before applying another. Krylon-brand spray paints, among others, are non-toxic when dry. Use a clear coat spray paint as the final coat to act as a sealer. You basically want an attractive design that blends into the landscape, attracts birds, is easy to install and is sturdy enough to hold up to any weather elements and not be easily knocked over. Even Baby Owls Enjoy a Good Bird Bath! Male Ruby-throated Hummingbird enjoying a bubbling bird bath. "That is a fountain I have in my backyard that bubbles at the top. 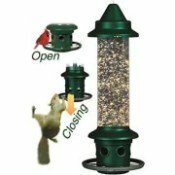 I have one feeder in the backyard as well and two in the front yard. We have lots of hummingbirds. This is the first year I have seen them take a bath. They show up every morning between 5:30 - 6:00am. They take turns one at a time, I know this because I have also seen a female taking her bath. The other morning I had 5 eating at the same time on a feeder that has 8 holes." Here are a couple photos Dot sent in of the male on the bird bath and a view of the of the fountain placement. Bird Bath Heater - To place inside an already existing bird bath as a de-icer to keep water from freezing. Heated Bird Bath - All-In-One units that can heat the water during the winter months. Stone Bird Baths - Basin and fountain stone bird bath designs. Solar Bird Baths - Save money and go green with solar power. 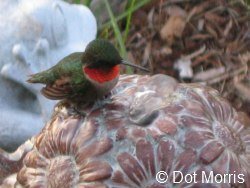 Best Bird Guides to help identify birds that visit your bird baths and feeders. Cardinal in bird bath photo courtesy of ehpien on Flickr.